Hamilton Tennis Club’s ladies’ first team continued their good start to the season with a 9-0 win against Kibworth Seconds last week. But the team of Emily Harrison and Margaret Roskell, Penny Hallam and Margaret Heggs, and Sue Corfield with Jessi Jackson will expect a tougher match next time out against near neighbours Oakham. In a good week for the ladies’ section the second team won a tight match against Quorn, and the third team whitewashed Oadby Granville Fifths. Margaret Shufflebotham and Sue Harrison, Sue Corfield and Rosie Gildove, and Polly Dolby with Eileen Merrison edged out Quorn 5-4, with both sides winning a tie-break. Margaret and Sue, and Rosie with Sue C won two sets each, while Eileen and Polly gained the vital fifth set. But there were no such problems for the third team of Jude Plumb and Sue Harrison, Nicky Herbert and Jan Jackson, and Pat Woolston with Chris Stevens as they swept aside Oadby. * The men’s fourth team of Graham Hall and Dan Belcher, Selwyn Carter and Ciaran Boylan, and Steve Plaistow with Simon Bligh lost 6-3 to Charnwood Thirds, with each pair winning a set. And there was an 8-1 defeat for the men’s fifth team of Graham Brown and Patrick Whenham-Bossy, Patrick Belcher and Nathan Morgans, and Steve Plaistow with David Mckain against Hinckley. Nathan and Patrick won the consolation set. * A disappointing week for the Hamilton veterans teams saw the men’s first team of Barrie Farnsworth and Craig Tracey, and Doug Hacking with Dave Gildove fail to pick up a set against Victoria. The ladies’ third team of Jan Brookes and Wendy Farnsworth, and Chris Hirst with Chris Stevens lost 6-2 to Birstall Watermead Seconds, with Chris and Chris winning two sets. 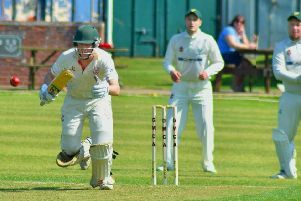 The men’s veterans third team conceded their match against Melton following a late withdrawal to illness, but the men’s second team did pick up a result against Charnwood. Graham Hall and Selwyn Carter, and Joe Cunningham with Steve Plaistow claimed a 4-4 draw to relieve the gloom, both pairs winning two sets.